James Wilkinson played a unique role in the American Revolution. Wilkinson fought in the Revolutionary War and held many notable positions, including Senior Officer of the Army and Governor of the Louisiana Territory. All the while he was working for the Spanish, letting them know what the United States was up to. It is hard to tell whether Wilkinson was a hero or villian. James Wilkinson was a young Maryland native who, at the outset of the American Revolutionary War, volunteered to serve in the Continental Army. Wilkinson proved his value quickly and became an aide to Nathanael Greene. After fighting in Boston and New York, Wilkinson became an aide to Benedict Arnold in Quebec. Soon thereafter, James was promoted to aide Horatio Gates who he assisted in the Battle of Saratoga. Wilkinson, still just 20 years old, was the man sent to Philadelphia to deliver the good news about Saratoga. However, he claimed his role in the battle was more important than it actually was. Because of his false reporting, Wilkinson was promoted to Brigadier General. This angered many Generals, including Gates. James’ superiors forced his resignation to quell unhappiness within the ranks. James Wilkinson left the Continental Army and moved to Kentucky (then Virginia). He pushed for Kentucky to be recognized as a State. To secure this, he began secretly corresponding with the Spanish who, at the time, controlled the Mississippi River and the port at New Orleans. The Spanish began to pay Wilkinson for information about the American Government. His code name was Agent 13. After fighting in the Northwest Indian War, Wilkinson was respected enough to be considered an option for Senior Officer of the Army. The newly created Legion of the United States was the first professional army under the Constitution. Wilkinson was passed on for Anthony Wayne. Although James was second in command, these two men began a heated rivalry. Wayne eventually found proof that Wilkinson committed treason and was prepared to bring him to trial. However, Wayne passed away before the charges could be brought to court. For some reason, no one seemed to care that James was about to be convicted of a high crime. He was chosen as Wayne's replacement for Senior Officer of the Army. This meant that, after the President, Wilkinson was the most powerful military man in the United States. After the Louisiana Purchase, Wilkinson had the honor of being one of the men who accepted New Orleans on behalf of the United States. He was also appointed as the first Governor of the Louisiana Territory. About this time, James began working for the Spanish again. Wilkinson was involved with Aaron Burr’s attempt at conquering land in Texas during his term as Governor. When the secret conspiracy was revealed, he went to testify in the treason case against Burr. Wilkinson presented documents which were clearly falsified. Because of this, Burr was released. Additionally, the Jefferson Administration was made to look bad as Wilkinson was their star witness. Somehow, Wilkinson was still not removed from his position. He held the post of Senior Officer of the Army almost continuously for thirteen years. After participating in the War of 1812 with middling success, Wilkinson was appointed as the first Envoy to Mexico. He was in Mexico City during that nation's revolution for independence. Wilkinson built the first diplomatic relationship between Mexico and the United States. He passed away a few years later in that nation's capital. There are actually a surprising amount of books about Wilkinson. 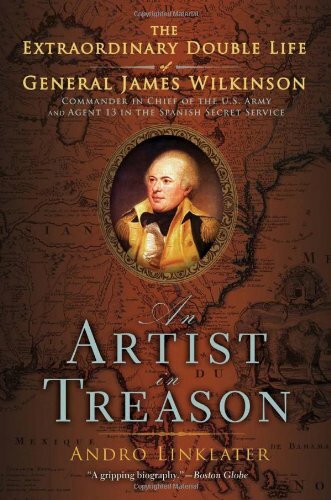 I recommend 'An Artist in Treason' because it simultaneously explains his life, Spain's place in the Revolutionary War, and how a Double Agent could openly hold such high office in the early republic. It's an enchanting book which blurs the lines between 'good guy' and 'bad guy' during the Founding Period. Purchase from Amazon through the link below and support this site at no additional cost to you. As always, please remember to subscribe to our email list for a new Founder every day right to your inbox. I assure you we do not give away any of your information, nor will we try to sell you anything dumb.